My place is close to public parks, Art and culture, great views, restaurants and dining. This is the hub of food and shopping in Mumbai. Two malls and Multiplexes just across the Road. You’ll love my place because of the location, the people, the ambiance, the outdoors space, and the neighborhood. My place is good for solo adventurers, business travellers, families (with kids), and big groups. My Apartment has spacious 3 Air-conditioned Bedrooms with 3 Toilets with separate wet and dry area. One toilet is equipped with Bathtub with Jacuzzi and other toilet is equipped with shower panel with different types of shower. The kitchen is equipped with large capacity Refrigerator, Washing Machine and Water purifier. All the Bedrooms and Living area has balconies to relax in the evening with drinks to sooth your nerves. The place as good night life with more than 150 fine dine Restaurants with 1 km range. Great views and newly made apartment with all luxury amenities including bathtub and shower panel in Master toilets. (1) All 3 bedrooms are fitted with split AC. Safe is built-in the wardrobe with locking facilities to keep valuables. (2) Kitchen has 450 litre Refrigerator, Washing Machine, Aqua guard (Water Purifier), 3 burner gas stove with chimney, Toaster and Microwave. (3) Dry area and Wet area are separated in all 3 toilets. Toilets have WHB, Hands free WC, separate shower area in all toilets, one Master toilet has bathtub with Jacuzzi, another Master toilet has shower panel. Hand wash and bathing soap also provided. (4) Living room has five seater sofa, six seater dining table, TV, Wi-Fi. (5) Kitchen is equipped with utensils to cook food, Tea/coffee sachets, Green Tea sachets, Tea powder, sugar etc. is provided to prepare Tea/ coffee. (6) Bed sheets, Duvets, Towels and Napkins, provided. (7) Maid facility is available. Maid will come in the morning to sweep/mope the floor, clean the toilets and wash the utensils. The entire home is yours. Only registered Guests will be allowed access to the Apartment. We will need Passport, OCI, Pan-card, Aadhar card or valid ID emailed to us upon confirmation of rental. The id proof is required to fulfill statutory compliance. Centrally located place in Mumbai from where all areas are easily accessible by Autos, Cabs, Metro rail, Trains, Buses etc. One of the best neighbourhoods of Mumbai - mall, nightlife, shopping, restaurants all at one place. The locality has 150 restaurants with appropriately 40 fine dining restaurants. Public transport like Autos, Taxis, Ola/Uber Taxis, and Bus service are available from door step. Nearest Metro station is 1 km, Andheri Railway station is 2 km and International Airport is 7 km from my place. Smoking is allowed only in the Balcony of Living room with decency that no Ash and Cigarette butts are thrown out of the Balcony down below. 340 sft living room with dining area to seat six people comfortably. 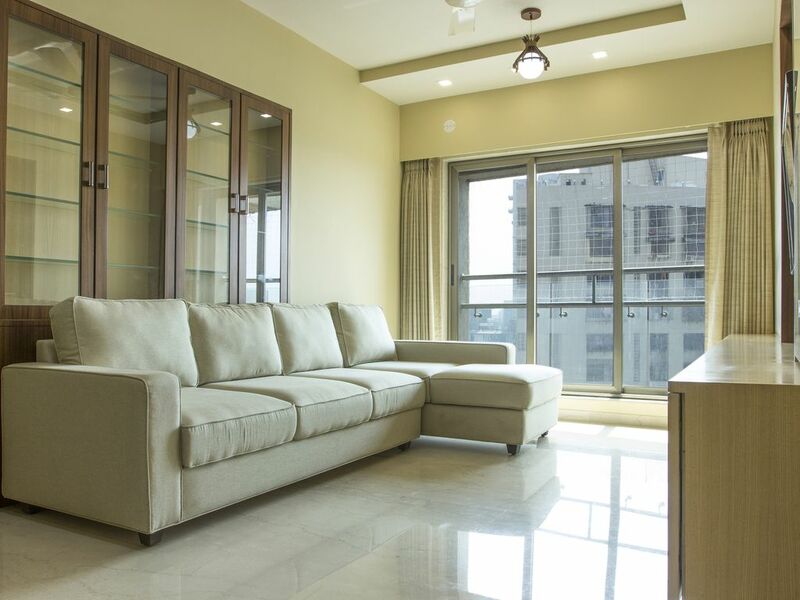 Living room has access to balcony with a view of International Airport and Arabian sea. Stainless steel plates, glasses, disposable plates, cups, glasses, spoons, tissue paper etc. are provided. Utensils are also provided to cook food. Dishes and utensils can serve 6 to 8 persons. 160 sft fully equipped kitchen area. Thanks ma'am for your encouraging review. Always welcome to my home.